Want to be more inclusive? Communicate that way. “If you’re not actively including people, chances are that you’re accidentally excluding them.” Dr. Heidi Grant, the Chief Science Officer of the NeuroLeadership Institute and others stress this point almost every time we talk about inclusion, especially in relationship to leadership. That’s a high bar for leaders—and anyone else for that matter—to reach. And it’s because of human biology. Based on the way the human brain is built, it’s easier for someone to feel excluded than included. Because we humans are incredibly social, we want to feel that we belong to the group. At the same time, we’re also wired to look for threats to our well-being. So if we detect even the slightest indicator that we could be left out or snubbed, we feel pain. Leaders who want to be inclusive need to balance acknowledging people’s sense of belonging and their diversity without threatening them. It’s an important goal, because inclusion affects everyone. So how do leaders signal they’re being inclusive, especially with the way they communicate? 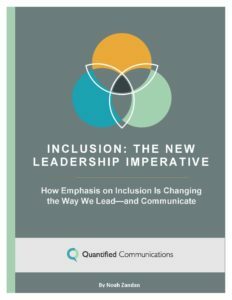 Now thanks to the research team at Quantified Communications, the specialized analytics firm for whom I work as a contract executive communications coach, we have detailed answers about inclusive communication and the way it’s used. Quantified used its proprietary communication analytics platform and benchmarking database to evaluate how leaders—CEOs, university presidents, politicians, and TED speakers–show their commitment to inclusion through communication. This includes how these leaders use inclusive language as well as body language, nonverbal cues and gestures. The headline? 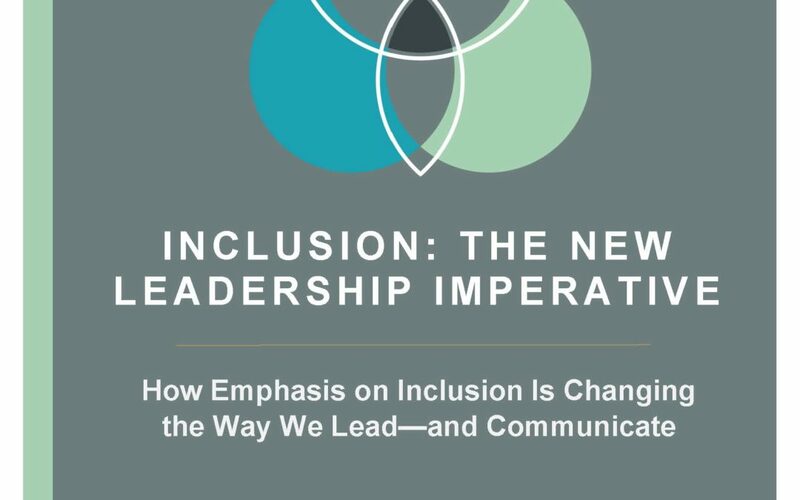 Very few leaders, including corporate and political activists, have adopted an inclusive communication style, even with the increased emphasis on inclusion in the workplace. Instead, the leaders’ language is similar to the average speaker in Quantified’s database. The leaders’ language shows they’re sticking with traditional speech patterns, even for those leaders championing inclusion in their talks to external audiences and employee groups as well as in their media interviews. By contrast, if you want to be inclusive with your language, you need to create a sense of community and shared ownership. You also acknowledge and thank people and their contributions. Plus, you recognize that different people have other perspectives, and you state that you value the differences, without blowing them off or dissing them. Also to be an effective inclusive communicator, you listen, not just talk. In short, you’re willing to show your vulnerability rather than demonstrate your smarts. Another surprising result from Quantified’s research is the gender difference. Men use 6.7% more inclusive language than women, based on a random sample of 2,000 keynote addresses and media interviews, 1,000 for each gender. We’re not sure why. It may be that non-inclusive language is baked into our cultural vocabulary. Or women in business may feel pressure to communicate like traditional business people (a la men) to be taken seriously. At any rate, it’s worth paying attention to if you want to be more inclusive in your communication. The moral of the story? Work to match your words with your message, even though you may need to make a special effort. When leaders emphasize they value inclusion, yet their words tell another story, individuals can notice the disconnect. They’ll then discount the efforts to be inclusive, which furthers sets back the leaders and the organizations as being committed to inclusion. And when you do match your words with your message, you’ll also be sending the signal that your communication style reflects your values. It made me think that maybe there are some deep-rooted paradigms at play as well. Many of the games we play as we grow up reinforce competition more than collaboration. And I wonder what well known people are excellent models of congruent inclusion? Thanks for your comments, Chris. And glad you liked the post. According to Quantified Communication’s database, business leaders who use their language to signal an inclusive environment are Facebook’s Mark Zuckerberg and Sheryl Sandberg and the recently retired HP CEO Meg Whitman. Meg Whitman also does one of the best jobs of avoiding exclusive language, which includes such words as “but,” “either,” and “without.” Former President Obama and First Lady Michelle Obama are also inclusive speakers. I’m hoping that the collaboration we’re now encouraging in the workplace and in schools will help us speak more inclusively.